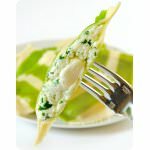 Vesuvio is a short twisted pasta that pairs wonderful with smooth sauces or ones with small pieces of meat and/or vegetables as the ridges of the 'mountain' shaped pasta will fill up. 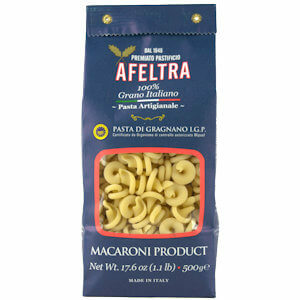 Afeltra pasta is artisan, handmade and extruded through bronze, the way they did it centuries ago. This procedure gives the pasta an exceptional flavor, thanks to the rough, porous surface which holds the sauce. This Italian Vesuvio pasta is named after the famous volcanic Vesuvius mountain. This pasta is made by Afeltra, located in Gragnano, Napoli; a company with state-of-the-art machinery, but continuing to respect the times and methods that are characteristic to the old Gragnanese tradition. 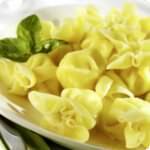 Every shape of pasta requires a different cooking time; the Vesuvio pasta requires is 8-10 minutes. 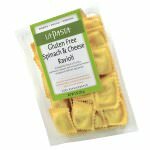 Ingredients: Pasteurized whole eggs, corn starch, tapioca starch, egg whites, potato starch, xanthan gum, canola oil, olive oil, konjac, sea salt.